Foodstand's partnership with Daily Secret continues! 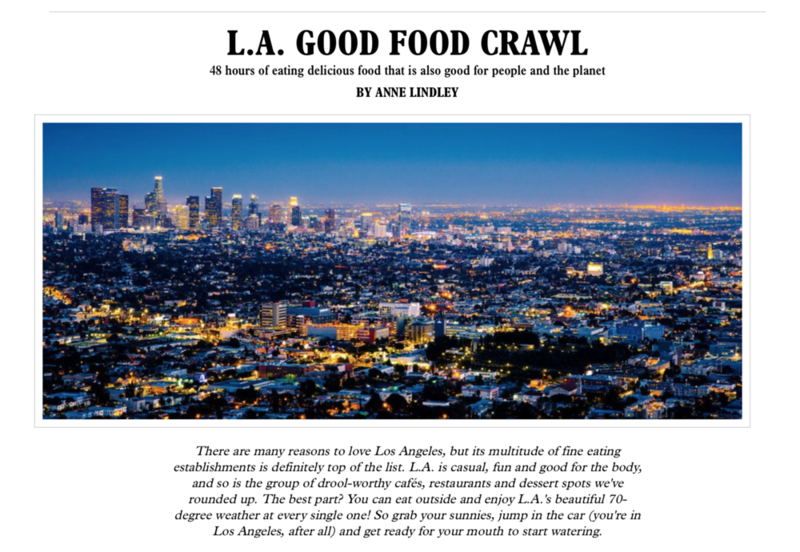 The NY Food Crawl piece I wrote was a big hit, so they asked me to do another one—but this time for Los Angeles! So here's one for the West Coast contingency. Enjoy! Off The Page and into your cup. I have loved Ruth Reichl for years. Of course as the editor of Gourmet magazine, but even more so as an author. Her memoirs Tender at the Bone, Comfort Me with Apples, and Garlic and Sapphires allowed me to delve into the world of food in a new way. An exciting way— one that would forever leave me wanting more. So when I read about Off The Page, a Random House Books event at which Ruth was the key speaker, I knew I had to attend. I walked in, and immediately crashed into my friend Todd Rubin. Todd lived down the street from me in Marin, and seeing him across the country was completely unexpected! He is the president of The Republic of Tea, purveyor of premium teas based in Novato, California. Perhaps I shouldn’t have been so surprised… food industry influenced event and all. The reason for Todd’s guest appearance? 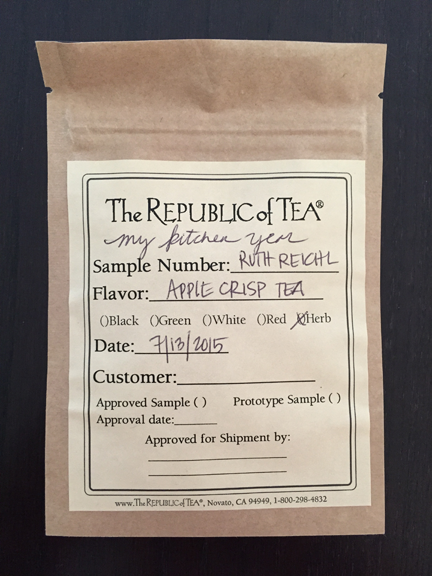 The Republic of Tea’s latest— Apple Crisp Tea inspired by Ruth Reichl! Evidently Ruth’s publisher approached Todd to design a tea, and Todd will accompany Ruth on her book tour this fall to debut the flavor. A conversation with Ruth and Dana Bowen, Executive Editor of Every Day with Rachael Ray and past Executive Editor of Saveur Magazine, kicked off the day. And the conversation didn’t disappoint. Early on Ruth said, “The food here in the Hudson Valley is better than anything you can get in Provence.” Wow. What an endorsement. Certainly reinforces my choice to live here, in large part because of the amazing food and produce of the region. But the followup was really what peaked my interest. She noted this “strange food time” we’re in, such that people with money have never eaten better (in the Hudson Valley, for example), but people with no money have never eaten worse. That’s a really interesting way to think about it. It’s like the disappearance of the middle class— the disappearance of decent food. Granted in some places amazing produce isn’t widely available, but in many places money can purchase some amazing ingredients and products. Then on the other end of the spectrum you have the anti-food. This stuff is the cheapest-of-cheap crap that I can’t in my right mind call “food”. A processed product that’s filled with salt, fat, and sugar, as well as chemicals and hormones. It made me think. And wonder what’s really going to make this situation change. Ruth's words were an inspiration once again, this time spoken at Off The Page instead of written on one. Last month I listened to a conversation between Alice Waters and Dan Barber of Blue Hill at Stone Barns (Blue Hill savory yogurts were served at Off The Page) and Alice said “there’s no such thing as cheap food”. She has a point. One could interpret her statement to mean that the cheap stuff isn’t really food, as I suggested a few moments ago. But I think her intended takeaway is that someone has to pay the price. Say you buy an inexpensive burger at a fast food restaurant. The workers at the restaurant aren’t making a living wage, so they’re paying for it with their extremely limited lifestyle and inability to afford good food or healthcare themselves. And you're eating meat with hormones and other unappetizing things, so you’re paying for it in the form of your health. You eat chemical and hormone laced foods now, and down the line you end up paying the healthcare company for your medical bills. So maybe it’s time that people pay for the cost of good food up front, and skip the costs down the line. It's an ongoing conversation. One that started before Off The Page, and one that will continue long after. But I was right— it was an event I had to attend. To see Ruth Reichl and hear her speak about the dichotomy between the two classes of eaters, something I am passionate about and address in my work everyday. And also to see my friend Todd, a reminder that human connection is ultimately one of the most important things. Maybe that's what we need more of. The next week I received a package in the mail reminding me of the previous weekend’s Off The Page fun— a tasting packet of Apple Crisp Tea, as well as The Republic of Tea’s Matcha and Matchia tea powders from Todd! Ruth’s Apple Crisp Tea is familiar and comforting, and refreshingly not too sweet. Just like Ruth. And as of today is available for order! Just in time for fall, and the public launch of the Foodstand app in early October. Stay tuned- the conversation will continue. Perhaps over a cup of tea. What have I been up to at Foodstand these days? Writing about Manhattan! My latest article for Foodstand was just published by Daily Secret, the definitive guide to discovering the best things life has to offer. Check it out! KB's salad with grilled Mahi, grilled yams, black beans, guacamole, cabbage, carrot, corn, cilantro, onion, romaine, spinach and cilantro-lime vinaigrette. All for $8.99. Recently the Man and I returned to Idaho after a trip to LA where we celebrated the marriage of two of my good friends, saw family, and were treated to a delicious engagement party by my mom's closest family friends. (The Man calls them my "other moms".) The trip was perfect and I'm still glowing from all the love and fun, but after circumnavigating the globe for the nth time this year (okay, a total exaggeration, but I have been on 42 flights since January), we were hungry and fairly tired. We pulled into town at around 8:30 pm, and after having had sticker shock on our trip to the Golden State (evidently I have gotten used to lower prices in Connecticut!) we were excited to have a dinner that was not only fairly quick, but also reasonably priced to make the ol' pocketbook happy. We tried to mix things up, and went somewhere we hadn't been to in quite some time. And unfortunately, we could have chosen better. No argument- the dinner was tasty. But somehow a shrimp salad, fajitas and one Corona added up to $55 which totally blew my mind. And I thought LA was expensive! As we were walking away I said "We should have gone to KB's. There's really no reason to go anywhere else. It's the best." The Man agreed. KB's (or Ketchum Burrito) has been around since 1993, and as of this year will have four Idaho locations. I suppose inexpensive Mexican food is a fairly common occurrence in the states (despite our $55 mistake) but it's rare that you leave feeling as though you've just eaten something really nutritious. And after a meal at KB's, I do. All of their signature menu items are delicious and wildly popular, from their Jordan's Burrito with pork, yams and guacamole, to the Famous Fish Tacos with cabbage and Cabo sauce (okay, not sure about the nutrition on that one, but the Man loves it). But the magic to their menu for me, is the Create Your Own Salad option. And as you can tell from the burrito with yams, they have an awesome selection of ingredients to chose from. Grilled fish, beans, avocado and yams on a big pile of lettuce and spinach? For $8.99 (without tax)? This has to be the most economical, nutritious and delicious meals in the Wood River Valley. Plus, the owners and staff are some of the nicest people around. Like I said, KB's is the best. I recently wrote a review of Hidden Valley Eatery in Warren, Connecticut. Amazing breakfast and lunch. Go. Eat. And tell me about it. Well, Mountainside Café in Falls Village is the other gem that the Man and I frequent on a regular basis for breakfast, lunch and weekend brunch. It happens to be five minutes from our house, and is located directly in front of one of our favorite hiking spots which makes it dangerously tempting... Let's face it, we usually cave. I'll get to the food in a second, but first we must discuss some other fantastic things about Mountainside. The Café is actually an arm of Mountainside Drug Rehab and Addiction Treatment Center, one of the most cutting-edge, prominent facilities in the east, known for its individualized holistic programs. Extended Care is one such program, providing clients with support as they get back into the world post treatment. And the Café? It helps to provide these clients with a healthy work environment to support independent living. Pretty cool if you ask me. I love my community more every day. Back to the food because that's why you came, but doesn't knowing that the café is doing good beyond food make it taste even better? For breakfast, it's all about the eggs. When we go out, the Man always orders a pancake with fried eggs and bacon for breakfast, but Mountainside's inventive menu makes him stray from the norm. More specifically, the Johnny Cash Breakfast Skillet. Their portions are ample, and Johnny Cash's two scrambled eggs on home fries with bacon, cheddar, tomato and sour cream are sure to last you for a good chunk of the day. If he has a sweet tooth, the Man goes for the French Toast. And I steal the fruit compote that comes with it. It's about time I get to steal something off his plate, since he always steals off mine...! For his lunch it's the Cuban sandwich with roast pork, ham, cheddar, pickles and preserved red onion on grilled ciabatta. The side salad it comes with has more of those preserved red onions, and makes a great foil for the delectably rich sandwich. But if you're not a salad guy or gal, you can have sweet potato or french fries instead. Or, if you're feeling particularly indulgent, order the sandwich with its side salad, plus a side of sweet potato fries. Which is clearly what we do because the sweet potato fries at Mountainside Café are delicious. They are served with a spicy mayonnaise dipping sauce that is also quite irresistible. I wrote a post a little while ago about Sweet Potato Fries, and now I'm talking about them again, so apparently I'm a fan. I could just eat sweet potato fries for lunch because they're that good, but I always order the Whole Grain Salad as well. Without the whole grains, of course. Sans wheat berries, the salad consists of a beautiful bed of mixed greens and herbs with roasted cauliflower, toasted hazelnuts, and dried cranberries, all dressed with a light sherry vinaigrette. It might even beat out the sweet potato fries. Stiff competition over at Mountainside. See for yourself, and be sure to visit with sharing people, because you'll all want a nibble of every dish on the table. I don't write about restaurants and food shops on the blog just for the sake of writing. If it's bad, it's not worth my time writing about, nor is it worth your time to read. And if it's good but not great, well you don't need to read about that either. So these reviews, they're about my favorites. My go to, miss it when I'm out of town, never had a bad meal, love the people and know their names, insist you go if you're in town sort of places. And Hidden Valley Eatery in Washington, Connecticut is one of these such places. Hidden Valley is casual, not overdone. And it's full of character and heart with rocking chairs on the front porch and an arch made from tree branches at the entrance to the dining room. The ambiance is friendly and comfortable, everyone who works there makes you feel at home, and the food is perfection. When the Man describes Hidden Valley, he says that it's very Anne food. friendly, meaning there are a lot of things for me to order despite my dietary restrictions. I pride myself in trying to navigate a menu with as little help as possible from the server, mainly because I try not to be a pain in the neck about the pile of stuff that's off limits for me. Occasionally I have to ask if there's dairy in something, but if possible I try to order a dish that's obviously safe, and avoid the things that are unclear and potentially hazardous. You know that person who has a million allergies and requests the beef wellington with no pastry, or the cream of tomato soup with no cream... I refuse to be that person. And maybe I go a little overboard the other direction. But at Hidden Valley I never have to think about it- they actually note gluten-free, vegetarian, and vegan dishes on their menu, which is quite helpful for the person like myself who refuses to ask. But don't let the labels deter you folks who scoff at the limited-diet fad, because Hidden Valley has plenty of Man food as well. In fact, the Man's favorite pancakes can be found at this fine place. (And they're actually gluten-free, but you'd never know...) They also serve perfectly cooked eggs, bacon and potatoes at breakfast, and great sandwiches at lunchtime. As for me? I typically have a hard time choosing between eggs with a side of perfectly cooked vegetables and goat cheese, or the Eatery's Granola (Did you see it up top? Isn't it gorgeous? Those figs and berries...!). It was perfect. Casual, full of character and heart, not overdone... wait this is beginning to sound familiar. Hidden Valley really was the place for us to have breakfast that morning! Back to the restaurant- it's also a store. All of their amazing gluten-free and gluten-filled sweets (carrot cake, anyone?) are available to take home with you, as are an assortments of oils, honey, maple syrup, jams, snacks, chocolate, kombucha and other pantry favorites. Eat there, and go home with a nibble for later. Can't beat that. And apparently magical things happen at Hidden Valley Eatery too! It's worth a visit. It will become your local haunt. I'll see you there. This past month I was asked to write an article for Sun Valley Property News (SVPN) about an art show that has a lot of different components. Paulette Phlipot, a local food photographer, is passionate about real food and getting back to the ways of natural eating. So when asked to have a photography exhibit, she took it one step further, involving local food organizations, local restaurants, and giving back to the community. I took the opportunity to further Paulette's mission to educate our community about real food, and write about our Wood River Valley and the pieces and people in the community that play integral roles but are often overlooked. We see the details- a farmer's market here, a good restaurant there, but it's easy to forget that they all fit together to paint a complete picture. Not just in the Wood River Valley, but everywhere. I met a lot of wonderful people in the Sun Valley, Idaho food community while writing this piece, one being Ali Long of the Local Food Alliance, which you'll read about below. The following week I received an email from Ali- she cc'ed me on a letter recommending Anne food. as a contributor to Foodstand, a new app seeking to create an active food community. I had a phone call with the Co-Founder of Foodstand a few days later, and was excited to find out that their goal is exactly what I was writing about in my article- connecting farmers, chefs and consumers together- in the form of an app! Check out Foodstand's website. The app takes the form of Instagram for food people, and allows you to create a profile by identifying what type of food person you are (food lover, chef, food writer, farmer, market, restaurant, etc). To start with, Foodstand is creating a web of people in the food industry. And it's growing to become a resource for everyone- for asking/answering food-related questions, discovering new restaurants and people within your community, and finding recipe inspiration while being able to locate the necessary ingredients from local farmers and retailers in real time, all within the app. Things come full circle... Thanks to Ali for connecting me with Foodstand! And thanks to Paulette for having an inspiring show. And to Kim at SVPN for asking me to write the article. Community is running strong. I look forward to furthering my relationship with Foodstand, and hope to integrate a direct feed from my profile on the Foodstand app into the Anne food. blog very soon. And I also look forward to furthering my relationship with the Wood River Valley food community. Which should be everyone- we all eat, right? Check the article out below, and more to come on the Foodstand front... Enjoy. I'm obsessed with this salad. It's the perfect combination of warm and hardy, yet fresh and light. It has a crisp crunch from the lightly cooked Brussels sprouts and creaminess from the chèvre that starts to melt on the warm greens and squash. It's my favorite thing to eat for lunch, and you can find it at The Haven. Well, on The Haven. It's a food bus here in Ketchum. The Haven's Warm Winter Salad of Brussels sprouts, kale, spinach, butternut squash, goat cheese and nuts. I got to know chef/owner Kellee Havens and her partner in food-crime Caitlin Hartley while working at PlayHard GiveBack last spring, just after moving to Ketchum. PHGB headquarters is located in "the old Mama Inez" building, as locals fondly say, referring to the space that once housed a local Mexican restaurant. Translation: there's a kitchen. Handy for making PHGB's signature trail mix, and also handy for Kellee and The Haven. I'm all for symbiotic relationships, and this is a great one. While a kitchen is integral to PHGB's trail mixing, packaging their product only demands kitchen time one day per week, resulting in an empty kitchen on those days dedicated to the computer. And since The Haven food bus is a bus, one that happens to serve amazing lunch bites involving long cooked meats (for example the Kobe Brisket Grilled Cheese with extra-sharp cheddar, charred onions and horseradish), a professional kitchen is extremely helpful to have. So they share! And unless Kellee and Caitlin are off catering an event, The Haven's green bus can be found outside of PHGB on the corner of 7th and Warm Springs Road every Monday - Thursday from 12 - 2pm. I made friends with Kellee and Caitlin, and was able to take in all of the amazing aromas that were floating around the PHGB office while designing away on my laptop. Then of course, I simply had to walk outside to eat lunch at The Haven because it smelled so good, and Kellee's descriptions of the daily menu were too mouthwatering to pass up. It's a clever scheme they have going on (kidding). But I was hooked. I now work from home, but one day last week the Man was kind enough to deliver my lunchtime favorite to the house. And the following day I ventured to the truck myself and sat on the deck outside PHGB to devour the same thing again. Two days in a row. I couldn't help it, it's just so good. The Man adores the Warm Winter Salad as well, but he orders it as a side with the Patty Mack, a pan-seared Mac and Cheese with extra-sharp cheddar, breadcrumbs, cream and bacon. It smells as amazing as it sounds. That and The Haven's freshly baked cookies? The Haven's menu changes practically daily (though lucky for me the Winter Salad has been a seasonal fixture! ), and they're the only place in town to change things up so regularly. Coming from California I've been spoiled by restaurants with nightly menus, and it's refreshing to see a menu here that's in keeping with the seasons, and reflects availability of ingredients. Just last week Kellee got in some beautiful wasabi arugula, and the following day served Leek Risotto Cakes on Spicy Greens to showcase her fresh produce. I wish more restaurants in Ketchum would follow Kellee's lead and pay tribute to the seasons with the food they serve. Not only does the menu change regularly, but it always features a wide array of dishes to meet everyone's desires. Vegetarian soup with spinach, chickpeas, coconut milk, ginger and mint; Herb Chicken Sliders on freshly-baked rolls; BBQ Pulled Pork Pita with cabbage slaw; Chicken Pot Pie with a homemade biscuit; Veggie Curry with apples and cilantro; and the CBLTA, a chicken sandwich with bacon, lettuce, roasted tomato and avocado are just a handful of the inventive twists on old favorites that Kellee comes up with. Plus she's always keen to accommodate alterations for weird allergies and preferences, which, I obviously know firsthand. Thanks, Kellee! Lately Kellee has been on a grilled cheese kick (which you may have guessed from my description of the Kobe Brisket above) with variations like the Chicken Parmesan that features chicken meatballs, brie, and roasted tomato, and the Bourbon Apple with extra-sharp cheddar and brown sugar. And even the Turkey Brie Melt with avocado and roasted bell pepper. Why terroir matters, for more than just wine. Terroir. It’s a buzzword in the wine world these days, like “single origin” is in the chocolate world. But they’re not just trendy phrases; these terms have become ubiquitous for a reason. A wine’s terroir, or a chocolate’s origin is a significant contributor to its story and flavor, playing a key role in differentiating one wine from another, or one bar from another. Wine importer and distributor Neal Rosenthal is all about terroir, and has been for 38 years, well before it became a fashionable term to throw around. His primary goal is to find wines that are the most purely representative of where they are made. “People don’t make wines, God does,” says Neal. A wine is great largely due to its place of origin; the wine’s characteristics come from the soil, the rock, the exact climate that exists on that piece of land in that village. The local ambient yeasts that form on the skins are exactly as described- local and ambient- and can’t be replicated elsewhere. That’s what terroir is all about- the characteristics of a wine that can’t be recreated. They occur naturally. When asked if he can taste the terroir, Neal replies “I profess to know everything,” chuckling himself, and creating a wave of quiet laughter across the audience. This was the audience at a tasting event with Neal Rosenthal and Italian vintners Giampiero Bea and his disciple Gaetano Gargano, hosted this month by Michael and Marianne Albin, owners of Hudson Wine Merchants in Hudson, New York. Giampiero Bea and his brother Giuseppe make wines on their family’s vineyard in Montefalco in the province of Umbria. Their father, Paolo Bea, has been developing their family’s vines under his name for ages (the family's origins in Montefalco date back to the 1500's). Gaetano has been working in conjunction with Giampiero to develop his own label, Il Censo, on his family’s estate in Sicily. I first became familiar with Neal’s wines, including the Paolo Bea label, while working at Chez Panisse. Jonathan Waters, the director of all things wine at Chez, was very fond of Neal’s imports, and my palate was largely shaped by the education Jonathan (and therefore Neal) bestowed upon me. Out of the restaurant setting, though obviously still ensconced in the food world, I now become excited whenever I see one of Neal’s wines in a shop or on someone’s dinner table. The Man and I had been at Hudson Wine Merchants a couple of weeks previous, and you can imagine my excitement at seeing Paolo Bea’s San Valentino on the rack. After striking up a conversation about Bea, the Man being the Man, somehow got us an invitation to this tasting event. Or should I say, Michael was kind enough to entertain the Man’s self-inclusion and expressed that my being in the food industry and having worked at Chez was reason enough for us to come. I was shocked at the Man’s audacity, errr... impulse, but admittedly was quite excited about the outcome. The tasting was nothing less than expected; in fact it was far more. On the beautiful third floor of Michael and Marianne’s building of which Hudson Wine Merchants occupies the ground level, the brick-walled, hardwood-floored, well-lit space was a perfect venue for the intimate tasting of 30. As it turns out the guests are all the closest of friends, as many were eager to tell me, due to the fact that Michael is a bit of a mayoral figure in Hudson. “Oh you’re going to Ted’s house for dinner tonight? Then you must bring Wine X as he has been dying to try it and it will go perfectly with the lamb he is serving.” Talk about community- I'm impressed. Upon my arrival Michael swooped in and introduced me to a few people, preventing one of those potentially awkward social situations us introverted people sometimes experience in a large group, of which they know no one. He also mitigated my feeling of guilt for having somewhat invited myself, and at the end of the afternoon very sincerely expressed his enthusiasm for my bringing the Man the next time. There would be a next time! My excitement about this tasting is multi-faceted. Neal Rosenthal’s name holds a lot of weight in our house, so meeting him, clueing him into what I’m up to with Anne food. these days, and seeing his enthusiasm over learning that we live in close proximity to one another was mind-boggling. Secondly, tasting amazing wines, particularly those I am already familiar with, and getting to see how recent vintages vary from previous years (a lot! which, as Neal says, is great!) is always enjoyable and was such a treat. Thirdly, meeting new people was great fun. But perhaps most importantly, particularly as it pertains to terroir, is the strong community of Hudson reflected in the people at the event- something I’m actively trying to seek out now more than ever. All communities are wonderful. Connections between people are what make the world go ‘round. But each community is slightly different, and that’s because each place is different. Each place has it’s own terroir, and not only does that effect the grapes that grow in its soil and therefore the wine that’s made there, but also its people and its culture. The Man and I have been talking a lot about place recently; discussing family, and the community as it pertains to our lives. Traveling back and forth between two places highlights their differences, as well as their similarities. What makes the communities in northwestern Connecticut and the surrounding Hudson Valley different from those in Ketchum and the Wood River Valley? It’s the terroir. Each is an amazing place. But if you were to uproot the community in Hudson and transplant it in Ketchum, it wouldn’t be the same as it is now, and vice versa. Let’s take the food and wine community, for instance. The Hudson Valley is lush, and offers beautiful fertile land with a great farming history. And recently there has been a resurgence of this farming community- young people are growing food in a sustainable and progressive way. Why? Many reasons, but one must be that New York City is two hours south, and there is a farm-to-table movement exploding in Brooklyn and Manhattan. So Hudson is full of produce and young people, and a community of growers and purveyors with similar interests is born. It wasn’t overnight, but now you see the same bearded faces with rolled up skinny jeans walking down Warren Street in Hudson as you do in Williamsburg, Brooklyn. Artisans are everywhere, honing their craft and sharing it and their passion with others. Community is born. I’m not siting that trajectory I just referenced as the only reason why Hudson is what it is, but that’s one story that suggests why the community I experience in Ketchum is different than the one out east. Different surroundings, different history. Different terroir. The fact that Bea’s native grapes grow in Umbrian soil, many on vines that are over 120 years old, is obviously key. But I again reference terroir’s larger picture. Paolo Bea’s vines are 7 feet off the ground, allowing Bea to grow vegetables and other crops under the grapes, making full use of the land. They have olive trees and fruit trees. And while they’ve recently reduced the number of farm animals on the property to accommodate their booming wine business, the Beas used to have cows, pigs, chickens, ducks and rabbits scurrying around the land as well. It was an entirely self-sustaining farm. And that too, is part of the terroir. A community grows around something like that. Wines are made that go well with duck breast, and gatherings ensue. It’s a special thing, a life like that. And while I may never see that exact picture, chickens scurrying about an olive tree studded vineyard, I aspire to my own version. A version that is what it is because of terroir. Anywhere else and it wouldn’t be the same. And hopefully my version continues to develop and take shape in part because of the local communities like that at Hudson Wine Merchants. It's the persistence of people like Neal to pursue and showcase that which is the most pure, and artisans like Paolo Bea and his sons to create and further what nature has to offer around them... Buzzword or not, that’s the real deal. The idea for Anne food. was born in January, just three months ago. I wasn't sure where it would lead, and still don't know exactly. What I do know is that cooking and food writing have become the heart and soul of my passion, and following one's passion is what makes people tick. And sometimes you have to take a blind leap to get where you want to go, even if you don't quite know where that is. The last few months have been amazing. I've been asked to cater some incredible events, I was approached by a lifestyle magazine to be their food writer, and I've received countless encouraging words and much enthusiasm from all of you which means the most. Another fun aspect has been people coming to me to write about their fantastic businesses, instead of the other way around! I wrote a piece about Rubiner's Cheesemongers & Grocers in February that they retweeted, bringing Anne food. some visibility in their network of followers. The next day I got an email from the awesome Carla Turner, the (wo)man power behind Turner Farms Maple Syrup in South Egremont, Massachusetts, just a stone's throw away from Rubiner's in Great Barrington, Mass. It's all about the network and the community. Carla's husband Paul grew up with his family on the land where Turner Farms sits today, tapping maple trees and making syrup as a kid. His childhood hobby turned into a profession in the mid 80's, and Paul and Carla have continued to successfully grow their maple syrup business over the years. From 300 taps to over 4,000, and with the help of two extra sets of hands along the way (their children! ), it's still all in the family. The Man peering into the boiling pans. I visited Turner Farms twice in the last month, bringing the maple-adoring Man along on my first visit to meet Carla, Paul and their son Trevor. There's actually more going on at Turner Farms than just maple, and it really is a family affair! Paul and his brother Bill run a dairy farm during the day- the last remaining dairy in Egremont, Mass! Our visit was perfectly timed to see Paul and Trevor milking the cows that wandered in a single-file line into the barn, and out the other door, udders relieved. I could have fallen asleep to the sound of the milking machine, it was very pleasantly meditative. I didn't want to leave! In addition to the daily dairy activities, come February the Turners start tapping their trees for maple season. They have a six week window to collect the maple sap before the tap holes dry up and it gets too warm outside. The ideal weather for a large sap yield consists of freezing temperatures at night followed by a thaw and warmer temperatures first thing in the morning, which is why March is prime maple season. This cycle causes the sap to flow due to a pressure change in the trees. And hopefully by evening time you have a lot of sap to boil! Which is why I revisited the farm at night to see the boiling in action! The sap flows out the taps, through lines that run between the trees, and into large tanks at the bottom of the slope that Paul empties into a large truck. Once back at the farm, the syrup flows through hoses into the sugarhouse, making its way into the evaporator. As you can tell by the photograph of Paul below, it's BIG! While they started with a rig that burned wood, the Turners' current setup burns oil which is much safer because it can be manually turned off without having to wait for the wood to burn out. Sap is heated in multiple large pans and turns to syrup at 218 degrees, at which point it flows out of the evaporator and into a large vat. Carla and Paul keep an eye on the thermometer and carefully regulate the syrup's temperature by controlling a hose bib-like knob on the side of the evaporator. By restricting the flow, the syrup remains in the evaporator for a longer period of time, raising its temperature. Periodically Paul measures the density of the syrup with a hydrometer, and makes adjustments as needed. The final step before bottling or placing in barrels for storage is the filtering process. Paul and Carla stir diatomaceous earth into the vat of syrup, which flows through a hose and into a filter press. The diatomaceous earth forms a matrix in the press that acts as a natural filter, allowing the syrup to flow through while trapping any solids. And there you have it- the syrup is ready! Last step- the filter press! The maple shop attached to the sugarhouse. They make online sales, have product in local shops, and sell it themselves using the honor system. Simply fill out a receipt and put your money in the box! The Turners' maple syrup is amazing. Its flavor is one of the most complex yet delicate I've tasted. The Man is an amateur maple connoisseur of sorts, having grown up in Massachusetts tapping trees as a kid himself like many New Englanders. When we tasted the syrup Carla sent home with me, even he was blown away. I think it's the Turners' passion- that's what makes the syrup so good. For them it's about the product, absolutely. But it's also about the network and the community. That's why they tick, and boil the best syrup around. I got to pet some cows and was practically lulled to sleep by the noise of the milking machine. I was amazed by the clouds of steam spewing from the roof of the sugarhouse as I drove up to see the boil, and the maple rain inside the sugarhouse as the trapped steam condensed on the roof. I was even more amazed by the overwhelming sweet aroma of maple inside as the boiling was taking place (something that probably should have occurred to me earlier...). And now I'm able to share their story with you. But my favorite aspect was making friends with wonderful people in the context of a natural, family-made product with integrity. Seeing the hard work that goes into it, and the community that surrounds it. Because that's what life and food are all about. Passion, community, and coming together. I can't wait to see where Anne food. takes me next! Last weekend the Man and I went on a culinary adventure to Hudson, New York. The mission of our mini-journey was to visit Talbott & Arding Cheese and Provisions, the newly opened gem-of-a-food-shop that I had discovered online the week before. I was excited about my food find not only because it looked fantastic, but also because I knew owners Mona Talbott and Kate Arding practically 20 years ago, separately. I was a kid with a mother who was obsessed with good food (I wonder where I got it from...), and was lucky enough to accompany her and my father on their visits to Chez Panisse Café, where Mona was the salad cook. My mother, being my mother, had a deluge of questions for Mona on every visit. And being the good sport that she is, Mona shared her secrets of olive oil and specialty vinegars with my mom which meant a lot of time spent at the salad station in Chez Panisse's open kitchen. A few years later a teacher of mine was planning her wedding, which meant more food-talk time with Mona as the caterer; my mother was in heaven. My own food journey took me to work at Chez Panisse in 2009, at which point Mona was the Executive Chef at the Rome Sustainable Food Project at the American Academy in Rome. Mona and Alice Waters had founded the project just a few years before, and her name came up regularly in conversation both in the kitchen and offices at the restaurant. And just last year her name came up again, only this time in my own house. The Man has been eyeing the American Academy in Rome and its Rome Prize, a fellowship awarded yearly to 30 emerging artists that grants them a year in Rome to explore and hone their talent (while eating amazing food). I was secretly proud of myself for knowing what he was talking about when he began telling me about the Academy, and naturally have interest in the Academy's food project myself because of Mona! Ironically I met Kate in a completely unrelated way, at Cowgirl Creamery's Tomales Bay Foods in Point Reyes Station. My father was involved in preserving West Marin's farmland, and was on Marin Agricultural Land Trust's Board of Directors with Sue Conley of Cowgirl Creamery. Sue's then-new creamery cheese store needed an accomplished Head Cheesemonger, and Kate was the woman for the job, coming directly from the highly acclaimed Neal's Dairy Yard in the UK. Excited to support a friend's developing business, my father introduced my mother to the delicious shop, where she struck up many a conversation with Kate about cheese. We weren't disappointed, the Man and I. I knew Talbott & Arding would be an amazing shop, but it exceeded even my sky-high expectations. We sat on the bench by the front window and nibbled on grape leaves with seasoned rice, artichoke hearts, and pickled vegetables from the cold case. Going back for more, the Man discovered a savory onion tart that he had warmed up, and I devoured the toasted quinoa salad with fennel and and herbs. Our third trip to the register yielded a bar of chocolate, a piece of almond cake, and cheese. And our fourth, a chocolate walnut cookie. It was getting embarrassing. Everything was perfect. The dolmas were moist and tender, the rice perfectly seasoned. The pickled vegetables were a lovely texture and vinegary to my liking. The quinoa and fennel salad had me making those strange noises people make with a mouth full of something exquisite. The savory onion tart blew the Man away, which pleased me greatly because I urged him to get it knowing that Kate's cheese and Mona's Chez Panisse experience would marry and create the most heavenly bite of the day. (If you're at Chez Panisse and there's a savory tart on the menu, get it. No matter what. It will knock your socks off.) The sweets were equally as mouthwatering. The almond cake was devoured so quickly I didn't have a chance to snap a photo, as was the cookie. The cheese was enjoyed the next evening with some Armagnac we purchased at Hudson Valley Wine Merchants down the street, and quickly vanished as well. The scene of the indulgent crime. I eat cheese practically every day. Mostly with eggs, sometimes with fruit, and often on its own. Pecorino Romano is my staple- a hard, Italian, sheep's milk cheese that I use as one would Parmigiano Reggiano. Most likely some dude from Rome and some dude from Parma are rolling around in their graves right now because of my cavalier comparison, but for someone who can't eat cow's milk products, Pecorino Romano makes a great substitute for the more commonly used Parmigiano. As you well know, cheese, like anything else, comes in a variety of shapes and sizes. There are orange cheeses that come pre-sliced and individually wrapped (which scare me), truffle infused cheeses for $40 per pound, and everything in between. And while unique and expensive cheese isn't necessarily an everyday staple, just a bit can transform a meal, as can many artisan food products. For example, a crumble of roquefort, a sheep's milk blue cheese from the south of France, can turn some simple apple slices, toasted walnuts and escarole lettuce into a beautiful salad without breaking the bank. While going to the butcher for steak and the cheesemonger for cheddar used to be a commonplace occurrence, these days, specialty food shops are considered luxury. Adored for their fine selection of delectables, yet often scoffed at for the high price, the specialty store has turned in to the boutique. I support my local farmers and grocers, and avoid impersonal box stores. But as far as the bank account is concerned, shopping at fine little food shops exclusively would be the equivalent of eating dessert for every meal: extravagant and problematic. But a little dessert is a good thing. And so is a little boutique food shop. This post is evidently about cheese, but any good quality - albeit slightly more pricey - artisan product can transform a dish, and let you remain friends with your wallet. A bottle of amazing olive oil may cost more that you're used to paying, but it will work wonders when drizzled over some greens or a simple soup, and when used sparingly will last a long time. Just don't sauté your onions or grease a baking dish with it. Boutique shops like Rubiner's are great for two reasons that can be tied together by a line from Rubiner's website: "a cheesemonger's job is not simply to sell cheese, but to search out the best specimens available..." Matthew Rubiner became a cheesemonger in 1994 after a career in military policy analysis. In other words, he didn't open a cheese business because he had to; he opened one because he loves cheese. And his employees? They love cheese too. And want us to love cheese. So one reason to shop at Rubiner's is obviously the cheese. You won't find a better selection or quality anywhere else. And while the quote I reference is cheese-specific, it represents this passionate shop's mentality toward all of the products they carry. But beyond selection, you're going for the service. The experts at Rubiner's want to convey their love and knowledge of cheese to you. If you're looking for something like I was yesterday that is made from goat's milk, has a relatively mild flavor, and is a good melter, they're going to help you find it and give you a taste. You will have a great time, and leave knowing that what's in your bag is exactly what you were looking for, and is going to be delicious. And that's much more cost effective than leaving the supermarket with something that's mediocre, isn't quite what you were looking for, and you might not like. I exited Rubiner's having spent only $20 with a smile on my face and exactly what I needed in my bag for the baked pasta recipe I'll be testing this week. In this case, my staple just wouldn't do.